Results of patient engagement solution on 5-year HCAHPS scores; study by SONIFI Health. LOS ANGELES, Feb. 11, 2019 /PRNewswire/ -- SONIFI Health revealed new results from a study of HCAHPS scores showing positive, sustained benefits correlated with the company's patient engagement and education technology. While an initial study in 2013 showed a significant impact one-year post implementation, the updated five-year findings show improvements continuing in the key patient satisfaction domains measured. The study, which included nine acute care facilities using SONIFI Health patient engagement solutions, observed HCAHPS scores over a five-year period in four areas: overall rating, nurse communication, medication education, and recommend the hospital. 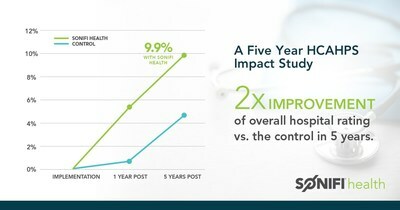 These results were compared to a control group comprised of similar hospitals without a SONIFI Health solution. The five-year study which includes new metadata from the Centers for Medicare and Medicaid Services, revealed that the gains seen one-year post-implementation continued to climb consistently. Overall hospital ratings averaged nearly 10% improvement after five years of using a SONIFI Health solution—more than twice the average improvement of a control group. The improved benefits over time may be attributed to increased adoption of the patient engagement technology as it becomes more embedded within the hospital's culture. "The data shows how incorporating SONIFI Health provides meaningful benefits to patient satisfaction and areas of care that are known to impact clinical outcomes," said Ahmad Ouri, SONIFI Solution's CEO. "We design technology to enable more meaningful interactions between patients and providers, and it's rewarding to see our efforts translated into positive results." Read the complete study findings here.